Bought this a few weeks ago on Ebay (for a whole penny + $5 shipping)...wanted to wait until the week of the Madison game to post it. That week is this week, so here you go. 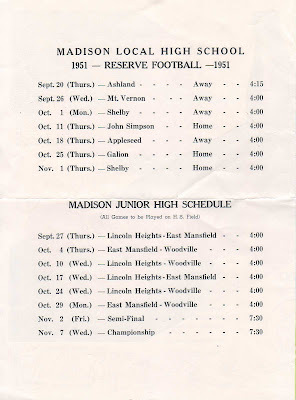 I'll show the pictures first and then dissect the minutiae of a 58 year old game program. Sounds fun, right? I thought so....enjoy. 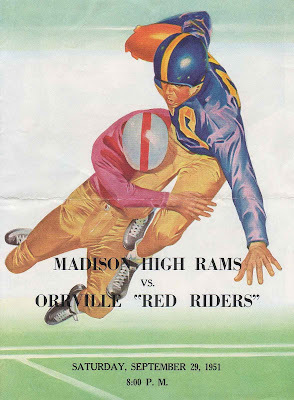 Interesting how "Red Riders" is in quotes, but Rams isn't. The date of the game is interesting too....the 8pm isn't too weird, but Saturday? Was this common to play high school games on Saturday? Like the photo....assuming just a stock photo like Orrville programs used to have. 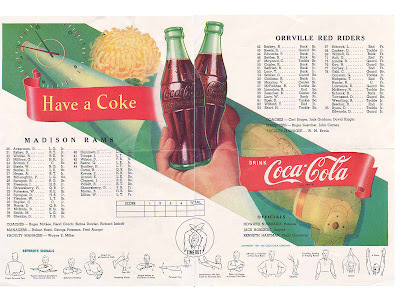 I'm not 100% certain, but I think Coca Cola may have been a sponsor. Pretty cool to see the officials names in print, that doesn't happen anymore. Carl Stager coached during the 1950 and 1951 seasons. His overall record at OHS was 6-11-2. Interesting how neither team had a player on the roster with a jersey number less than 20, and how a handful of players for each team had no number associated with their name. A lot of familiar names on that Orrville roster. That junior high schedule is interesting. Basically, three Madison feeder schools played each other 2 times each and then had a semi-final game (they did this somehow with 3 teams) and then a championship. That's it....4 pages to the entire program. Much more like a baseball scorecard than a football program as we know it today. Having to do 5 different programs (for 5 home games) a year with unique rosters for each team had to be quite time consuming and costly...but I like it. Much better than a loose leaf insert that we see today. What fun to see this! You keep coming up with good ideas of things to share on your site. Loved your comments and questions. I hope you get some answers. Might have to dig through my cedar chest to see if I have anything to share with you. Keep up the good work.